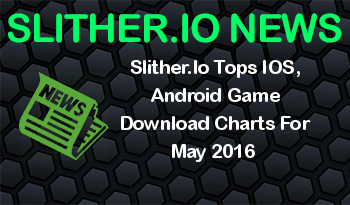 Slither.io was the top game, in terms of downloads, on iOS and Android in the U.S. in May 2016, according to application store optimization company Sensor Tower. The game challenges players to become the longest snake or worm possible, and it has been downloaded more than 20 million times in the U.S across iOS and Android as of this writing. Sensor Tower said almost 9 million of those downloads across both platforms took place in May, with almost 70 percent of the game’s estimated downloads coming from iOS users. Ubisoft‘s Hungry Shark World came in second on iOS and third on Android in terms of downloads last month, with an estimated 4.28 million downloads on both platforms in the U.S.
Other top games for May 2016 included Ketchapp‘s Stack, which came in fifth on iOS and sixth on Android last month, in terms of downloads, and Supercell‘s Clash Royale, which came in fourth on Android and sixth on iOS last month, in terms of downloads. Check out Sensor Tower’s complete data for May 2016 here.